Did you get a chance to see the reveal of the new flooring we had installed before the holidays? After living with it for 3 months now, I can, without a doubt, say that we are absolutely in love with our choice, and wouldn't change a thing about it! We chose to install wood look vinyl tile flooring, and for our family, it was the perfect flooring option, here is why we chose vinyl tile flooring over all the other options. 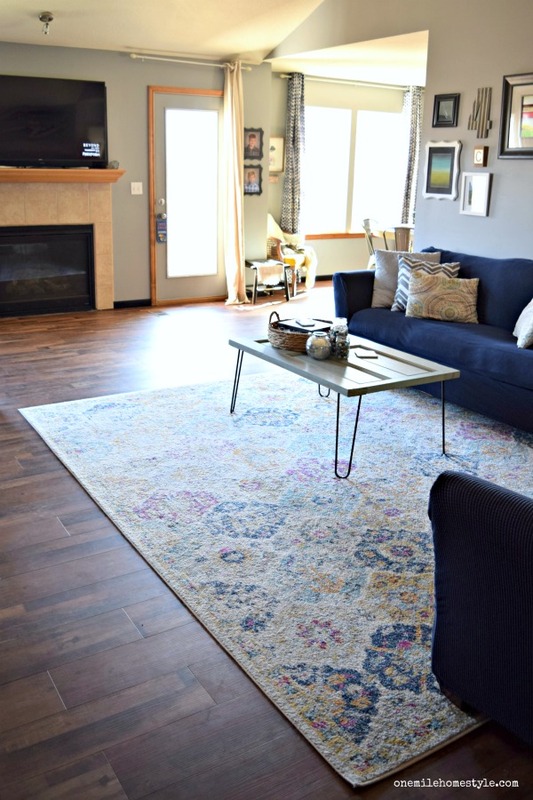 There were a number of factors that went into our decision when we decided it was time to tear out our builder-grade carpet and tile, but the two most important were durability and cost. With two boys and three cats, we knew we needed something that was going to be easy to clean, and could stand up to the daily wear and tear. And, because we have not yet won the lottery, we needed something budget friendly, but still looked great. We really loved the look of solid wood floors, and even considered them as an option. Laminate flooring has also come a long way, and has a ton of color/style options. 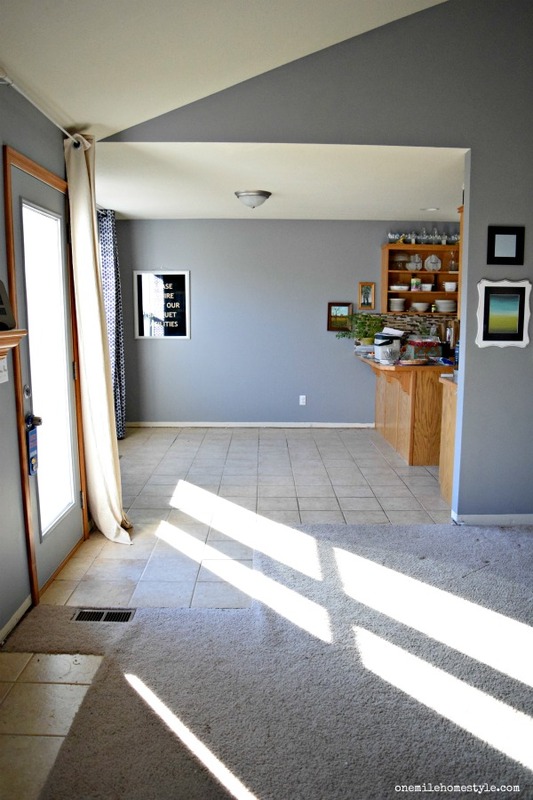 Vinyl tile flooring wasn't even on my radar, but once we saw the samples, we were sold. It clicks together like laminate flooring, which makes installation quick and easy, and has a great texture like solid wood flooring, without the higher cost. Budget being the number one factor quickly eliminated the solid wood flooring, we needed to stay under $5000 for flooring materials and installation for our living room/kitchen/dining area. Durability was the next consideration; we needed something that could handle foot traffic, but not show wear, and since kids aren't great at cleaning up spills, and the cats like to knock cups and flowers off the table, something that wouldn't be easily damaged by liquids was also important. I have heard stories of laminate flooring buckling/swelling due to missed wet spots, and then being difficult to patch, and that was just something I wanted to try to avoid. All of that brings us to the choice we ultimately made, wood look vinyl tile flooring. We had a number of samples to choose from, and we really fell in love with this rustic look tile plank that has a variety of wood tones, and has the time-worn farmhouse look we wanted. 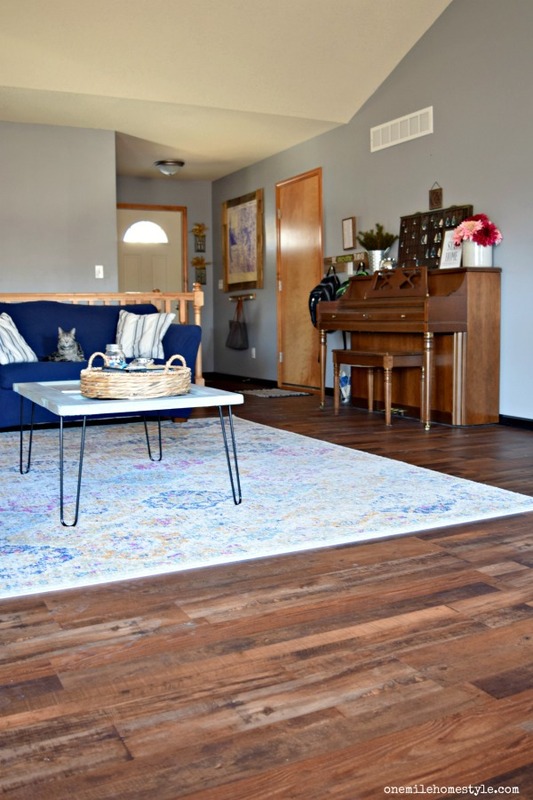 (We used a luxury vinyl tile purchased through our contractor, here are a few similar options: Oak Vinyl Plank Flooring, Kalahari Amber Vinyl Plank Flooring, Baja Vinyl Plank Flooring) Since it is a vinyl tile, it is super durable, and can stand up to spills and wet shoes amazingly well. It can scratch if you slide a heavy piece of furniture over it, but regular daily use won't hurt it a bit. It's also super easy to clean, I just use a Swiffer wet jet to clean it weekly, and a dry swiffer a few times a week to keep the dust bunnies away. 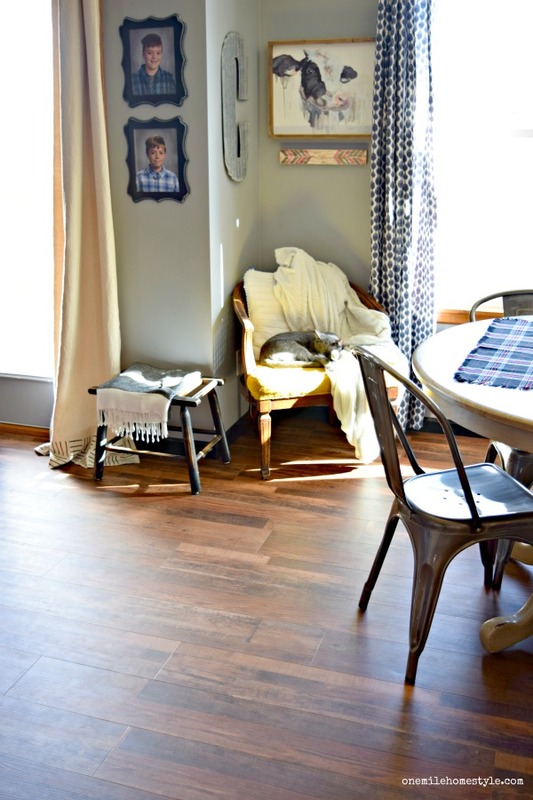 Overall, we couldn't be happier with our choice of wood look vinyl tile in our home. It has given us the look we wanted, on a budget, and is super durable. What do you think? 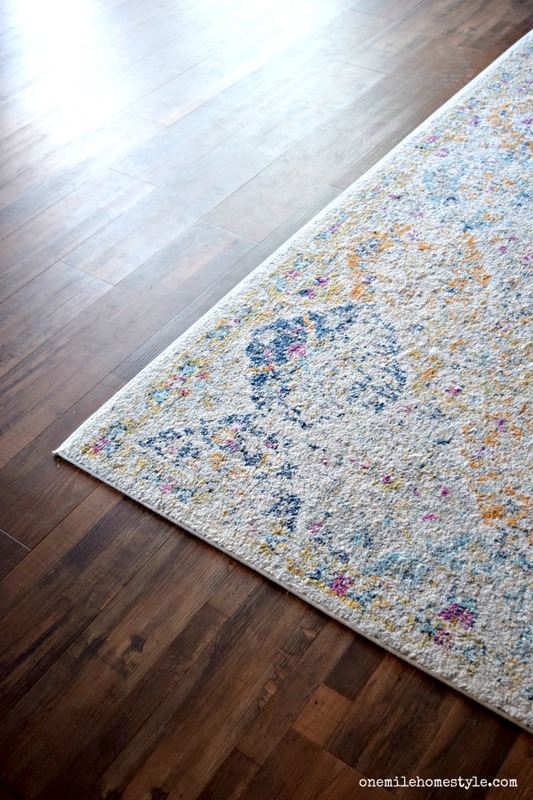 Would you consider this type of flooring in your home? P.S. Don't forget to enter the giveaway I have going on right now!! You guys did a heck of an update! Looks fantastic! Thanks Erica! It really did change the look of the entire house, I wish we wouldn't have waited so long to do it! Thanks Nakeya! It's an amazing (and super durable) alternative to hard wood flooring! Thank you SO much for this post! I have been looking for flooring options in the rec room of our home and was considering vinyl "wood" planks. I do like the high-end finish. I'm totally sold on this option now. You're very welcome Ola! I'm glad it helped in your planning for your rec room! Looks like you made the perfect choice for your family, with a ton of character to boot. It looks really nice in your home. Thanks Lela, we are so happy with how it turned out!